This article is about the band. For their self-titled album, see LCD Soundsystem (album). James Murphy founded LCD Soundsystem during 2002 in the New York City borough of Brooklyn. They began by releasing a string of singles under DFA Records, which was co-founded by Murphy. They gained attention with their first single, "Losing My Edge", which peaked at number 115 in the UK. Described as "an eight-minute, laugh-out-loud funny dissection of cool over a dirty electronic beat"; the single became an underground dance favorite. This was followed by the single "Give It Up", and in the following year, "Yeah" and "Movement". The latter two peaked at number 77 and number 52 in the UK, respectively. LCD Soundsystem released their eponymous debut studio album in January 2005 to critical acclaim. For the CD version, the first disc contains the album and the second contains a compilation of previous singles. They later released the single "Daft Punk Is Playing at My House" the following month, which became their first UK top 40 hit, peaking at number 29, as well as their most commercially successful single, charting in Australia, Belgium, and the Netherlands. The band toured with M.I.A. following the release of the album. In June 2005, the band covered a Siouxsie and the Banshees song, "Slowdive" for the B-side of their single "Disco Infiltrator". In December 2005, the group received nominations for two Grammy awards, one for Best Electronic/Dance Album with their self-titled album and one for Best Dance Recording with "Daft Punk Is Playing at My House." Their self-titled debut was also placed at number 94 of Amazon.com's "Top 100 Editor's Picks" of 2005. In October 2006, LCD Soundsystem released a composition entitled "45:33", as part of Nike's Original Run series. It was made available for download from iTunes. Despite its name, the track is actually 45 minutes and 58 seconds long—the title is a reference to vinyl speeds (33 and 45 RPM)—and was claimed to "reward and push at good intervals of a run". However, it was later revealed that this was not the case, but that Murphy merely wanted the opportunity to create a long piece of music, akin to E2-E4 by Manuel Göttsching. LCD Soundsystem's second studio album, Sound of Silver, was released on March 20, 2007, to critical acclaim. Praise included Mixmag awarding it the title Album of the Month, a 9.2 score from Pitchfork and a 5-star review from The Guardian. The album release was preceded by the single "North American Scum", which was released in February 2007. LCD Soundsystem's subsequent single "All My Friends" included covers of the song by Franz Ferdinand and former Velvet Underground member John Cale. The digital download "All My Friends" EP also includes a cover of the early Joy Division song "No Love Lost". In September 2007, the A Bunch of Stuff EP was released and the band went on tour with Arcade Fire. 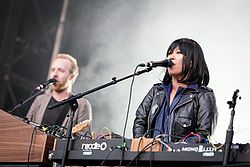 Late in 2007, the band released "Someone Great" as the third single from Sound of Silver and re-released "45:33" on CD and vinyl through DFA Records. In December 2007, there was a release of a 12-inch record containing b-sides from European singles for the North American market entitled Confuse the Marketplace. Also in December 2007, the band received a Grammy nomination for Best Electronic/Dance Album with Sound of Silver. The album was also named the best album of 2007 by publications such as The Guardian, Uncut and Drowned in Sound. The album was also nominated for the 2007 Shortlist Prize, where it lost out to The Reminder by Feist. Time magazine named "All My Friends" one of The 10 Best Songs of 2007, ranking it at number 4. Writer Josh Tyrangiel praised the "magic" in the song, saying that the song's "straightforward repetition of the same guitar, keyboard and bass lines, combined with lyrics about life without regret, and life with all kinds of regrets pays off with a punch about what we lose as we get older." The track was later named the second best song of the 2000s by Pitchfork. After finishing touring for Sound of Silver the band recorded and released a song entitled "Big Ideas" on the soundtrack of the film 21. This song was ranked number 63 on Rolling Stone's list of the 100 Best Songs of 2008. On November 18, 2008, Al Doyle seemed to suggest in an interview with 6 Music that the band would soon be discontinued. 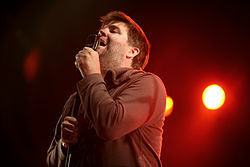 However, the following day both Doyle and James Murphy quashed this rumor, with Murphy indicating a new LCD Soundsystem album was on the way. Murphy began recording in the summer of 2009 in Los Angeles. Possible song titles mentioned at that time included "Why Do You Hate Music?" and "Love in LA". For the 2009 Record Store Day the band released a cover of Suicide member Alan Vega's song "Bye Bye Bayou". On February 23, 2010, the LCD Soundsystem website announced that the album had been completed. The first single was set to be "Drunk Girls" and on March 25, a stream of the song was put on music site One Thirty BPM. The title of the album and the cover were revealed on the DFA site on March 30. The album, titled This Is Happening, was released in the UK on May 17, 2010 and in the U.S. on May 18, 2010. Prior to the release Murphy promised that it will be "definitely better than the other two." Murphy stated that it was likely to be the last LCD Soundsystem album. "If you got a copy of the record early and you feel like sharing it with the rest of the world, then please don't ... We spent two years making this record and we want to put it out when we want to put it out. I don't care about money – after it comes out, give it to whoever you want for free but until then, keep it to yourself." For the 2010 edition of Record Store Day, the band released 1000 copies of a single-sided 12" single of This Is Happening track "Pow Pow". When speaking to The Quietus in August, Murphy insisted that LCD Soundsystem would continue to record music, stating: "We'll do some 12"s and things like that. I just need to get away from it being a big thing". On February 8, 2011, LCD Soundsystem announced on its website that it would be playing its last show on April 2 at Madison Square Garden in New York City. When tickets went on pre-sale and sale, there were widespread problems with availability and online ordering. Following the immediate sale of all available tickets, LCD Soundsystem announced that they would be playing four warm-up shows at New York's Terminal 5. The setlists at those shows were nearly identical to the setlist of the final show at Madison Square Garden. The final song performed by LCD Soundsystem at the farewell show was "New York, I Love You but You're Bringing Me Down". The show lasted almost four hours with appearances by Arcade Fire, Reggie Watts and others. LCD Soundsystem covered the Franz Ferdinand song "Live Alone" for the Franz Ferdinand Covers EP. The cover was released as a single through the Domino Recording Company on April 11, 2011. On April 12, 2011, Murphy confirmed, via LCD Soundsystem's Facebook page, the release of the final show on DVD, with a better quality than the stream offered by Pitchfork. In addition, a documentary called Shut Up and Play the Hits, chronicling James Murphy during the 48 hours before, during, and after the final show, screened at the 2012 Sundance Film Festival and later given limited release in select theaters. On March 5, 2013, LCD Soundsystem was named one of Rolling Stone's New Immortals—"currently active (or relatively recently defunct) artists who [they] think will stand the test of time." On April 19, 2014, the definitive live recording of the farewell show, The Long Goodbye: LCD Soundsystem Live at Madison Square Garden, was released in a 5-box vinyl edition. 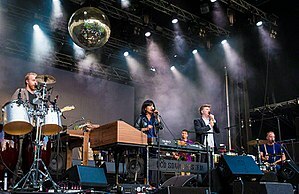 In October 2015, a Consequence of Sound article reported that "multiple sources" confirmed that LCD Soundsystem would be reuniting in 2016 and headlining "high-profile music festivals in the US and UK". This report was eventually confirmed by Billboard, but later that day, DFA Records label manager Kris Petersen stated that LCD Soundsystem would not be reuniting. DFA co-founder Jonathan Galkin also reaffirmed this in a Pitchfork article. On December 24, 2015, LCD Soundsystem released the Christmas-themed track "Christmas Will Break Your Heart", the band's first single in five years. Regarded as a "depressing Christmas song" that James Murphy had been singing to himself for years, the song was recorded during 2015 after Murphy had gotten past band members Al Doyle, Pat Mahoney, Nancy Whang, and Tyler Pope to come to DFA Studios in New York City to record the track. It was released as both a digital download and 7-inch vinyl. Both Consequence of Sound and Billboard again stated, after the release of the song, that "multiple sources" can confirm that LCD Soundsystem would reunite in 2016. The band's reunion was confirmed on January 4, 2016, when it was announced that LCD Soundsystem would be headlining the 2016 Coachella Festival. The following day, the band announced that they would be releasing a new studio album some time in 2016. Murphy, who worked on the album Blackstar, stated that David Bowie helped convince him to reassemble the band before Bowie's death in January 2016. On February 13, it was reported that LCD Soundsystem had signed with Columbia Records. On March 23, it was announced that the band would also be headlining the 2016 Lollapalooza Festival. The band performed two shows at Webster Hall in East Village, Manhattan on March 27 and 28, marking their first shows in almost five years. The event had a ticket distribution system in the form of a lottery. During the rest of 2016, the band headlined the Outside Lands, Austin City Limits, Bonnaroo, LouFest, and Wayhome festivals. In August 2016, the band canceled tour dates for shows in Asia and Australia in order to complete work on the album. Although plans were made to release the record in 2016, it was suggested that the release date would be moved into the following year, as the recording was predicted to take another few months. LCD Soundsystem performed their first show of 2017 at the then-recently opened venue Brooklyn Steel on April 6. During their performance, they premiered three new songs titled "tonite", "call the police", and "american dream" during the first encore of their set. A fourth new song, "emotional haircut", was performed during a later show at Brooklyn Steel. On May 5, the band released "Call the Police" and "American Dream" together as a digital double A-side single. Accompanying the single was a lengthy post on their Facebook page, which also included an update regarding the progress of their upcoming studio album. The band performed the two songs during the May 6 episode of Saturday Night Live's 42nd season. On June 19, the band revealed that the title of their fourth studio album would be American Dream and that it would be released on September 1 through Columbia Records and DFA Records. The tracklist for the album was also revealed as well as dates for a world tour. American Dream released to critical acclaim following the release of several singles. The album was nominated for Best Alternative Music Album and the song "Tonite" won Best Dance Recording at the 2018 Grammy Awards, earning the band their first ever Grammy win. The band performed three songs live at Electric Lady Studios as part of a Spotify Singles release, released on September 12, 2018, with the songs being "Tonite", "Home" (from This Is Happening), and a cover of the Chic song "I Want Your Love". Later, on November 2, the band released a cover of the Heaven 17 song "(We Don't Need This) Fascist Groove Thang" and teased a full live album recorded at the same studio, titled Electric Lady Sessions. Musically, LCD Soundsystem has been described as dance-punk and dance-rock, electronic rock and electronica, art rock, alternative dance, and post-punk revival. Members and dates are based on single and album credits from the band's discography. For a more comprehensive list, see LCD Soundsystem discography. ^ "LCD Soundsystem". Apple Music. Retrieved February 10, 2019. ^ Miller, Jeff (April 23, 2016). "Coachella 2016 Friday Weekend 2 Recap: Prince Tributes by LCD Soundsystem, Jack U, Ellie Goulding & More". Billboard. Retrieved April 23, 2016. ^ "LCD Soundsystem". Discogs. Retrieved April 28, 2016. ^ a b c Zywietz, Tobias. "Chart Log UK – L". zobbel.de. Tobias Zywietz. Retrieved July 16, 2013. ^ "'I speak as a lifetime failure'". Arts.guardian.co.uk. January 17, 2008. Retrieved February 12, 2011. ^ "Reviews for LCD Soundsystem by LCD Soundsystem". Metacritic. Retrieved July 2, 2015. ^ "The ARIA Report: Week Commencing 14 March 2005" (PDF). Pandora Archive. March 20, 2005. Retrieved April 17, 2015. ^ "LCD Soundsystem – Daft Punk Is Playing At My House". ultratop.be. Retrieved April 28, 2016. ^ "LCD Soundsystem – Daft Punk Is Playing At My House". Dutchcharts.nl. Retrieved April 28, 2016. ^ Snell, Herman (February 27, 2006). "LCD Soundsystem covered a Siouxsie and the Banshees song on this CD". JacksonFreePress.com. Archived from the original on June 4, 2012. Retrieved February 12, 2011. ^ "EMI Music earns 54 Grammy nominations including honors in key categories "Album of the Year", "Record of the Year", "Song of the Year" and "Producer of the Year"". EMI Group. December 8, 2005. Archived from the original on September 26, 2007. ^ "Message: Top 100 Editors' Picks". Amazon.com. Retrieved February 12, 2011. ^ a b "LCD Soundsystem records track for Nike". Side-line.com. September 16, 2007. Retrieved February 12, 2011. ^ Murphy, James (February 10, 2007). "Is this it?". The Guide. Guardian. Retrieved February 12, 2011. ^ "Metacritic – Sound of Silver". Metacritic.com. March 20, 2007. Retrieved February 12, 2011. ^ Pytlik, Mark (March 20, 2007). "Pitchfork Media Review". Pitchforkmedia.com. Archived from the original on January 13, 2009. Retrieved February 12, 2011. ^ Lynskey, Dorian (March 9, 2007). "LCD Soundsystem: Sound of Silver". Arts.guardian.co.uk. Retrieved February 12, 2011. ^ "LCD Soundsystem – North American Scum (CD)". Discogs. Retrieved April 29, 2016. ^ "LCD Soundsystem covered by Franz Ferdinand and John Cale for new single". Side-line.com. Retrieved February 12, 2011. ^ "Arcade Fire, LCD Team for Seven-Inch; Vedder, Malkmus, Tweedy Cover Dylan". SPIN.com. August 14, 2007. Retrieved February 12, 2011. ^ "2007's Best Albums" The Guardian, December 7, 2007. ^ Diver, Mike (December 23, 2007). "DiS's albums of 2007". Drownedinsound.com. Retrieved February 12, 2011. ^ Kharas, Kev (February 5, 2008). "Feist wins Shortlist Prize 2008". Drownedinsound.com. Retrieved February 12, 2011. ^ Tyrangiel, Josh (December 9, 2007). "''Time'' magazine's Top 10 Songs of 2007". Time.com. Retrieved February 12, 2011. ^ "Staff Lists: The Top 500 Tracks of the 2000s: 20-1". Pitchfork. August 21, 2009. Retrieved February 12, 2011. ^ "New LCD Soundsystem – "Big Ideas" (Stereogum Premiere) – Stereogum". Stereogum.com. February 25, 2008. Retrieved February 12, 2011. ^ Rogers, Georgie (November 18, 2008). "LCD Soundsystem reach end of road". BBC News. Retrieved February 12, 2011. ^ "LCD Soundsystem not splitting – new album on the way". NME.com. November 19, 2008. Archived from the original on October 11, 2011. Retrieved February 12, 2011. ^ "Hot Chip's Al Doyle: 'LCD Soundsystem haven't disbanded'". NME.com. November 19, 2008. Archived from the original on October 10, 2011. Retrieved February 12, 2011. ^ "James Murphy reveals details of new LCD Soundsystem album". Factmagazine.co.uk. September 1, 2009. Retrieved February 12, 2011. ^ "LCD Soundsystem Cover Suicide's Alan Vega on New Single". Pitchfork. October 7, 2009. Retrieved February 12, 2011. ^ "Listen to the new LCD Soundsystem single "Drunk Girls"". One Thirty BPM. March 25, 2010. Archived from the original on November 29, 2010. Retrieved February 12, 2011. ^ "Untitled no longer « dfa records". DfaRecords.com. March 30, 2010. Archived from the original on July 9, 2011. Retrieved February 12, 2011. ^ "LCD Soundsystem – New Album in April". AltRockNow.com. Archived from the original on February 12, 2010. ^ Vineyard, Jennifer (March 3, 2010). "James Murphy Opens Up About "Crazy" May LCD Soundsystem LP". Rolling Stone. ^ "LCD Soundsystem beg crowd not to leak album at New York show". Nme.com. April 13, 2010. Retrieved February 12, 2011. ^ "FACT MAgazine: The A-Z of Record Store Day". Factmag.com. April 12, 2010. Retrieved February 12, 2011. ^ Hewitt, Ben (August 26, 2010). "News | LCD To Record Again". The Quietus. Retrieved February 12, 2011. ^ "LCD Soundsystem – Live Alone (File, MP3)". Discogs. Retrieved June 28, 2016. ^ Photos by Max Blau (April 13, 2011). "LCD Soundsystem to Release DVD of Final Madison Square Garden Show :: News :: Paste". Pastemagazine.com. Retrieved March 31, 2012. ^ "oh-and quick thing..." Facebook. Retrieved March 31, 2012. ^ Menconi, David. "Phish - The New Immortals". Rollingstone.com. Retrieved April 6, 2015. ^ "LCD Soundsystem will reunite in 2016". Consequence of Sound. October 8, 2015. Retrieved October 15, 2015. ^ Grow, Kory (October 8, 2015). "LCD Soundsystem Label Rep Shoots Down Reunion Rumors". Rolling Stone. Retrieved October 15, 2015. ^ Strauss, Matthew (December 24, 2015). "LCD Soundsystem Share New Song "Christmas Will Break Your Heart"". Pitchfork. Retrieved December 25, 2015. ^ Daniel, Kreps. "LCD Soundsystem Release First New Song in Five Years". Rolling Stone. Retrieved December 25, 2015. ^ "Christmas Will Break Your Heart - Single by LCD Soundsystem". iTunes United States. Retrieved December 25, 2015. ^ "LCD Soundsystem - Christmas Will Break Your Heart (7" Single)". DFA Records. Archived from the original on December 25, 2015. Retrieved December 25, 2015. ^ Young, Alex (December 24, 2015). "LCD Soundsystem share Christmas song ahead of 2016 reunion tour". Consequence of Sound. Retrieved December 28, 2015. ^ Medved, Matt (December 24, 2015). "LCD Soundsystem Release First New Song in Five Years; Band is 'Getting Back Together,' Say Sources". Billboard. Retrieved December 28, 2015. ^ Minsker, Evan (January 4, 2016). "Coachella 2016 Lineup Announced". Pitchfork. Retrieved January 5, 2016. ^ "Coachella lineup announced: LCD Soundsystem, Guns N'Roses, Calvin Harris headline". Entertainment Weekly. January 4, 2016. Retrieved January 5, 2016. ^ Hendicott, James (January 5, 2016). "LCD Soundsystem release comeback statement: 'We're not just touring. We're releasing a record'". NME. Retrieved January 5, 2016. ^ Blistein, Jon (July 11, 2017). "LCD Soundsystem: David Bowie Convinced Us to Reunite". Rolling Stone. ^ Minsker, Evan (February 13, 2016). "LCD Soundsystem Sign to Columbia". Pitchfork. Retrieved February 15, 2016. ^ Gensler, Andy (February 13, 2016). "LCD Soundsystem Signs With Columbia Records: Exclusive". Billboard. Retrieved February 15, 2016. ^ Kot, Greg (March 23, 2016). "Lollapalooza 2016 lineup announced". Chicago Tribune. Retrieved March 24, 2016. ^ Brown, Harley (March 24, 2016). "LCD Soundsystem Announce Reunion Shows This Weekend In New York City". Spin. Retrieved March 24, 2016. ^ Blistein, Jon (April 5, 2016). "Radiohead, LCD Soundsystem, Lionel Richie Top Outside Lands Lineup". Rolling Stone. Retrieved April 28, 2016. ^ "Radiohead, LCD Soundsystem, Kendrick Lamar Top ACL Fest Lineup". Rolling Stone. May 5, 2016. Retrieved May 5, 2016. ^ "LCD Soundsystem sends LouFest crowd home on an ecstatic high". St. Louis Post-Dispatch. September 12, 2016. Retrieved September 12, 2016. ^ "LCD Soundsystem WayHome Stage, Oro-Medonte ON, July 22". Retrieved November 20, 2016. ^ Kaye, Ben (August 26, 2016). "Report: LCD Soundsystem cancel Asian tour to work on new album". Consequence of Sound. Retrieved August 29, 2016. ^ Trendell, Andrew (April 7, 2017). "LCD Soundsystem debut new songs at first gig of 2017". NME. Retrieved April 7, 2017. ^ Trendell, Andrew (April 10, 2017). "LCD Soundsystem debut a fourth new song, 'Haircut'". NME. Retrieved April 12, 2017. ^ "call the police / american dream - Single by LCD Soundsystem". Apple Music U.S. May 5, 2017. Retrieved May 14, 2017. ^ Gerardi, Matt (May 4, 2017). "LCD Soundsystem to release 2 new songs tonight at midnight". The A.V. Club. Retrieved May 5, 2017. ^ Tarnoff, Brooke (May 7, 2017). "Watch LCD Soundsystem Perform 'American Dream' and 'Call the Police' on 'SNL'". Billboard. Retrieved May 7, 2017. ^ Young, Alex (June 19, 2017). "LCD Soundsystem announce new album American Dream, plus lengthy tour". Consequence of Sound. Retrieved June 19, 2017. ^ Weatherby, Taylor (January 29, 2018). "41 Things You Didn't See on TV at Grammys 2018". Billboard. Retrieved November 3, 2018. ^ Kamp, Justin (September 12, 2018). "LCD Soundsystem Cover Chic on New Spotify Singles". Paste. Retrieved November 3, 2018. ^ Cetin, Marissa (November 2, 2018). "RA News: LCD Soundsystem tease new live album, Electric Lady Sessions". Resident Advisor. Retrieved November 2, 2018. Wright, Lisa (January 3, 2016). "Best LCD Soundsystem Songs". NME. Retrieved March 26, 2016. Moore, Bo (April 1, 2011). "The 10 Best LCD Soundsystem Songs". Paste. Retrieved March 26, 2016. Pittman, Sarah Marie (January 5, 2016). "LCD Soundsystem Talks Reunion Plans". Pollstar. Retrieved March 26, 2016. Leung, Andrew (March 9, 2016). "Is LCD Soundsystem Back Together? Here's The Scoop on the Coachella Headliner". Mic. Retrieved April 23, 2016. "LCD Soundsystem's comeback album refines the dance-rock eyebrow-archers' template". Thenational.ae. Retrieved October 2, 2017. Sisario, Ben (September 11, 2017). "LCD Soundsystem, Leaning on Traditional Sales, Has a No. 1 Album". Nytimes.com. Retrieved October 2, 2017. Miller, Jeff (April 23, 2016). "Coachella 2016 Friday Weekend 2 Recap: Prince Tributes by LCD Soundsystem, Jack U, Ellie Goulding & More". Billboard. Retrieved April 23, 2016. Haskoor, Michael (November 19, 2013). "The ABC's of... Electronic Rock in the Studio: The Doors to Depeche Mode & LCD Soundsystem". SonicScoop. Retrieved March 26, 2016. ^ "LCD Soundsystem: A Beginner's Guide". Read.tidal.com. Retrieved October 2, 2017. ^ Qadir, Fal. "LCD Soundsystem: Top 10 Songs". Project Revolver. Retrieved March 26, 2016. ^ "Is this it? What happened to the New York post-punk revival bands - BBC Music". Bbc.co.uk. June 2, 2016. Retrieved December 23, 2017. ^ "2007 Music Review - Rober Awards". Roberawards.com. Retrieved February 10, 2019. ^ "2008 Music Review - Rober Awards". Roberawards.com. Retrieved February 10, 2019. ^ "2010 Music Poll - Rober Awards". Roberawards.com. Retrieved February 10, 2019. ^ "2010 Winners". newyorkmusicawards. Retrieved February 10, 2019. ^ "There's still time to vote in our 2018 Reader Awards!". Classicpopmag.com. January 2, 2019. Retrieved February 10, 2019. ^ Greenblatt, Leah (November 9, 2009). "Jerry Fuchs, drummer with LCD Soundsystem, !! !, Juan McLean, dies after elevator shaft fall". Entertainment Weekly. Retrieved August 18, 2017. ^ Rayburn, Newt (July 13, 2013). "Local Musician J.D. Mark Passes Away". The Local Voice. Retrieved August 18, 2017.